There is a list of the applications which uses AppCrossPromoter. It would be nice to see your apps' link there too. If you use this library and want to see it in the head of the list, please inform me or send a pull request. 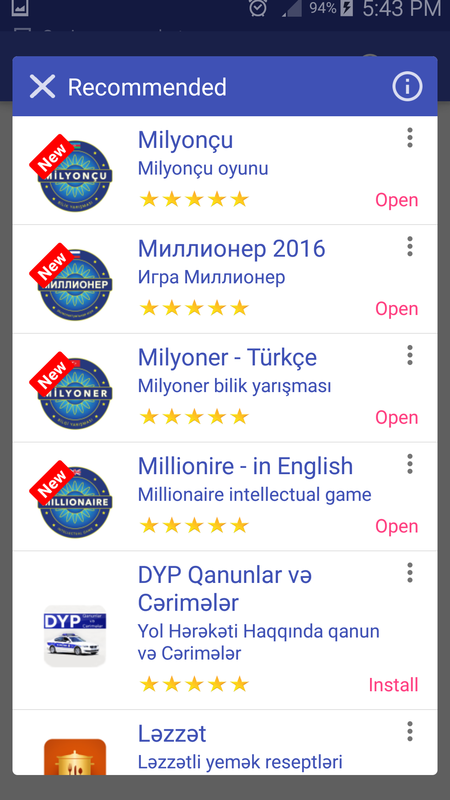 The AppCrossPromoter - Sample app has published on the Google PlayStore. 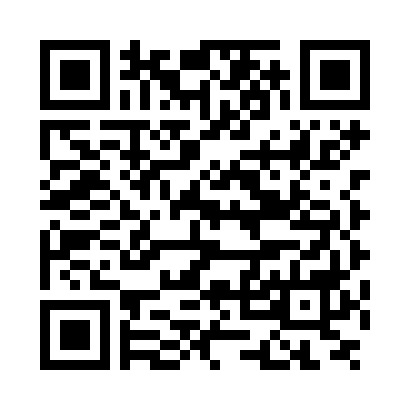 You can easly test the lib's functionality by downloading it. To provide your apps' list, you have to implement the service provider. The structure of the service is as below. Your root folder has to contain a imgs folder and two files - program_version.json, program_list.json. For details check the wiki. You can call it by the same way in Kotlin and Java. The library contains samples both in the Kotlin and Java languages. For the details, check the wiki. The last stable version is 2.5.5. To configure the library in your project, check installation wiki page. If you have any problems with configuration of the library or want to ask a question, please let me know. Create issue or write to settarxan@gmail.com. I will help. I am ready to hear offers and opinions from you. To help to translator in context, I have added some prefixes to the start of the string names. Be carefull when you translate. The prefixes are following:* < adjective > - adjectives* < command verb (actions)> - These are the command verbs which mean actions on the UI. 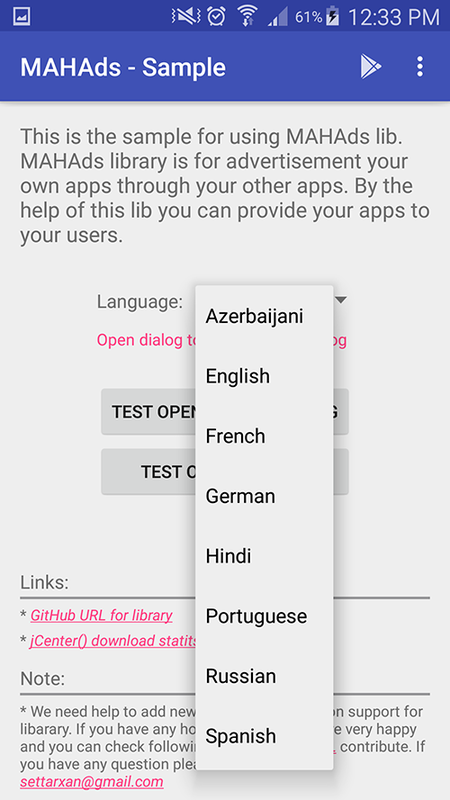 We need your help to add a new language localization support to libarary. If you had any hope to help us, we would be very happy and you could check the following GitHub Issues URL to contribute. To contribute, get the res/values/string.xml file and translate it to a newer language then place it on res/values-"spacific_lang"/string.xml. Please feel free to contact me or submit a pull request to add your app in the top of the list. - An Android library to check an update information on android device. 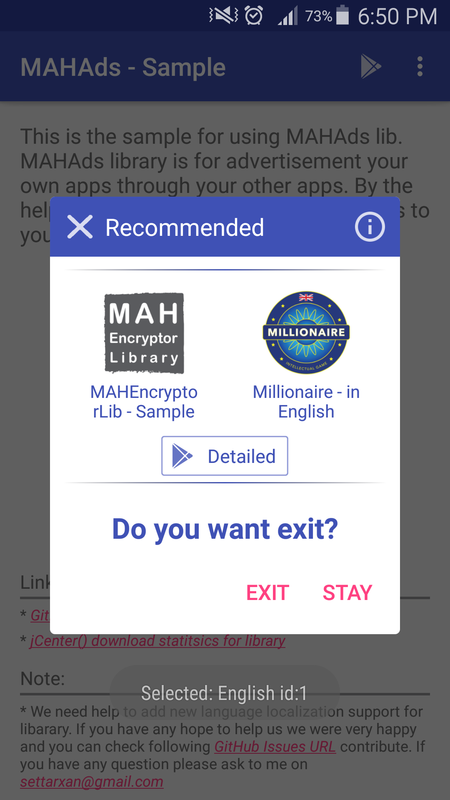 - The library to encrypt and decrypt strings on the Android apps and the PC Java applications.